I’ve been having a long conversation in the comments of another wordpress blogger recently. I was perusing the religion section of wordpress and ran across this post. The comments are where it gets interesting. If you are interested in such conversations, I urge you to take a look. Much of the following will reference that discussion, although you will be able to follow without reading it). During the conversation, which touches on skepticism and the definition of ‘atheist,’ the blogger jackhudson said that “there is no such thing as a ‘mere atheist’,” and I was forced to agree. Actually, I quite enthusiastically agreed, as I had never made such a claim that such a creature existed (see the comments there for the details, if you like). But I immediately liked the term and it gave me a little insight into the nature of our disagreement. It also reminded me of a discussion within the atheist community some time back. Remember that now infamous PZ post about “dictionary atheists” with which many atheists, including myself disagreed? Well, I do believe that the definition of “atheist” is still merely the lack of belief in any gods, but I also agree with PZ’s larger point which, ironically, is basically the point that jackhudson is making in the comments I have made reference to in this post. Ironic because the post is about PZ Myers being wrong about something. Well, it’s a little ironic. 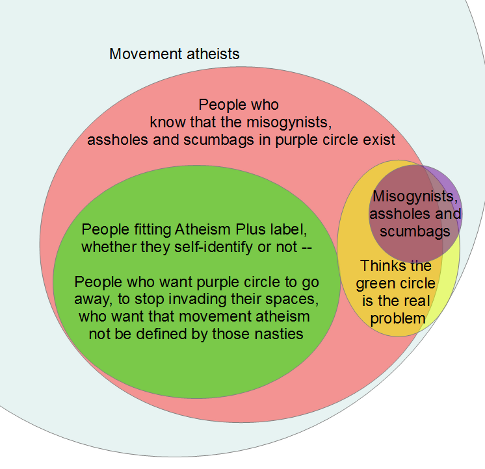 In other words, PZ Myers was right to say that we, as atheists, are not atheists because we lack a belief in gods. At the time he wrote that post, I disagreed by arguing, as did many pothers, that being an atheist was nothing more than this lack of belief in gods. But as I came to understand it, PZ had a larger view in mind, one which jackhudson is also making; none of us are merely lacking belief in gods. We have other things we do believe in and those things inform our worldview and tell us about how we are atheists. Even if the definition of atheism is, in fact, the lack of belief in any gods we are so much more than that. It’s a nuanced point, and I think worthy of further exploration. People come to find that they are atheists in a number of ways. As they do so, they carry all sorts of beliefs, assumptions, and worldviews (all of which may change, of course). But an essential moment for people who consider their beliefs is when they first realize that they no longer (or never did) believe in a god. Some of these just of shrug their shoulders and go on with their life. Others experience a great emotional relief, anxiety, or even anger upon realizing this. I imagine that some people even repress this and go on as if they do still believe. The reaction is dependent upon many personal factors which are relevant to a person’s worldview, but are not really relevant to the term ‘atheist’ per se. That is, if they accept that title as part of their identity, that title merely tells others what they do not believe (gods), but nothing about what they do believe in. Other labels and titles can do that, in most cases. Sometimes new labels have to be invented. But no information about what one believes can be gleaned, necessarily, from “I’m an atheist” by itself. So, I think that PZ’s objection is more about the existence of “mere atheists” rather than “dictionary atheists” (although I’m sure he is still annoyed with people reminding everyone of this definition, as his post indicates). Having heard him talk about this issue a few times however, I don’t think he disagrees that atheism, per se, is merely this “dictionary” use, only that this lack of belief does not tell you anything anything about what is important. And while I think it is still important to clarify one’s philosophical opinion (I am a philosophically-minded person, after all), I think that PZ is largely correct. I will continue to explain the definition when the clarification is warranted, but I think that this is becoming a secondary consideration for me. It is a bit of a transition I have been noticing for a little while; a bit of atheist maturing, perhaps. At this point, my concern is to not argue what the definition of atheism is so much as to answer the question that Matt Dillahunty has become known to ask (What do you believe, and why do you believe it?) for my own skeptical views. That is, I am more interested in explaining my views rather than labeling them and having arguemnts which are purely about those labels. It is true that I don’t believe in any gods. It is still true that to claim that no gods exist is beyond my epistemic powers. It is also true that in some cases (like with the Christian god) I do believe that ‘God’ is not real. But I think the fundamental point is to show that a skeptical position is where to start, and that I simply do not see reason to believe in people’s religious ideas. My motivation for all of this is not derived from being an atheist, but rather from being a skeptic who cares about having beliefs which are true. My being an atheist is not my motivation for writing this blog, being active in godless communities, etc. My motivation is what I do believe. I do believe that the truth matters. I do believe it’s important to want to have reasons for what we believe. I do believe that skepticism is the best methodology for finding what is true. I do believe that having a good level of certainty about truth is possible. I do believe that people can educate themselves towards freeing themselves from delusions of all kinds, including faith. I do believe that the efforts of the skeptical community are helping our culture move away from religious commitments, even if more slowly than many of us would like. So no, I’m not a mere atheist, and I don’t think any person is. To be a person is to have beliefs, even if only tentatively, and nobody is defined by a simple lack of a belief. But I still believe that identifying openly as a person who does lack that belief, in this cultural context, is important for the ongoing cultural conversation. I do think there will be a time when identifying as an atheist will no longer have a use (it will still be true, but only useful in the way that identifying as an a-Santa-ist is now). I have been following the recent discussion occurring between such epic bloggers as PZ Myers, Jerry Coyne, and Ophelia Benson about the issue of whether there could be any convincing evidence for there being a God. It started last Fall with a post by PZ and went from there, and I have not weighed in because I thought many of the points were covered by others and nobody really reads this blog anyway (not even my mom reads my blog…). Now, I generally agree with PZ, especially his views about how we should deal with religious people and their beliefs. His views on accommodationism are pretty on-target, from my point of view, and it has helped clarify my own views in some cases. Religion has had a couple of millennia to make a case for its fundamental concepts: the existence of the supernatural, the existence of deities, the effectiveness of priestly intermediaries, etc. It has failed. It does not provide support in the form of evidence or logical consistency; it also fails to show any pragmatic utility. Religion never does what it claims to do. At what point do we learn from experience and simply reject the whole worthless mess out of hand? Now, I am not in disagreement with this statement. Religion has failed to make its case over the millennia, and while it will most-likely not go away anytime soon, people would be better off rejecting the whole enterprise. But my issue is not with religion per se. My issue is with faith, theology, and the spiritual feelings (what Nietzsche calls the ‘metaphysical need’) that people have and which was probably the original cause, current maintainer, and future transformer of religion. Yes, religion has failed to make it’s case, but belief in god precedes and is not necessarily contained within religion. The question of the existence of god(s) is a general philosophical question that religions contribute to, rather than own. So while religion may have failed, this does not necessarily discount god (although it is certainly not working in the favor of each). The question of divinity is a more fundamental problem than the many trees of religion. Religion discusses specific conception of gods. Religion may play at trying to show a generic god, and especially among ecumenical and liberal theological schools it certainly does attempt to do so, but these games are constrained by the traditional definitions of gods that act as a restraining force against the larger philosophical question which is usually eschewed due to these traditional limitations. Religion plays Calvinball. There are no rules except what they make up as they go. So, could there be evidence for any gods? Could there be evidence for a god? I doubt it. My certainty of this doubt is pretty damned high. I’d be a 6.9 on Dawkins’ scale as well. But the issue is a philosophical and scientific one, and cannot be proven with absolute certainty. It is logically possible that a god exists that does not want us to know about it or the evidence for which is still beyond our capability to comprehend. This would not be the god of Abraham, of Hindu mythology, or of the ancient Olmecs, but a ‘god’ is not logically impossible in general. This god may decide to reveal itself at some point, and perhaps its attributes would not be the traditional omnimax god (omniscient, omnipotent, etc), but THAT IS PRECISELY THE POINT! The God that PZ Myers sees as impossible to find evidence for is the traditional western concept of a god, not any possible being that would deserve the name (an issue that becomes important in this discussion, but which will nonetheless be left for another time). If the traditional western concept of god were all that this discussion were about, then I would agree with PZ Myers (as Vic Stenger did with his God: The Failed Hypothesis) and I think Jerry Coyne might as well. The issue is that there are a plethora of other potential gods that might exist, be logically non-problematic, fit the naturalist worldview, etc whom decided to hide itself for whatever reason. I don’t believe in such a being because I’m a skeptic and the evidence does not exist for such a being and I reserve belief for such presented evidence. But if such a being existed the evidence could exist at some point (perhaps), and we would have to reserve our belief until such potential evidence presented itself. I’m not holding my breath, and neither should anyone else, in my opinion. The evidence as it exists now leads me to say that everyone should be an atheist now unless they 1) have said evidence already or 2) are delusional. And those who claim to be have #1 have not convinced me because their attempts at evidence has, as PZ points out, failed for millennia. In science, we’re used to incremental progress and revision of our ideas. Evidence is our currency, it’s how we progress and it’s what gets results. It is a category error, however, to think that the way to address free-floating word salad and flaming nonsense is to take the scalpel of reason and empiricism and slice into it, looking for definable edges. No, what you do is look over the snot-ball of self-referential piffle, note that it has no tenable connection to reality, and drop-kick it into the rec room, where the kids can play with it, but no one should ever take it seriously. Again, I agree. But this is NOT addressing the real issue. PZ is still addressing the existing traditional theological parameters for a god and declaring that they have failed, and I agree. Further, evidence for a generic god has failed as well, but this is not the same as saying that evidence cannot exist to convince me, Jerry Coyne, PZ Myers, etc ever. But the fact that we should not take it seriously is due to the accidental circumstances of lack of evidence that is not the logically necessary state of affairs for all times. We simply do not know what will come in the future, no matter how certain we are. That claim that no evidence is possible to convince someone like PZ Myers is not, as Jerry Coyne observed, the proper application of the scientific method. God is a scientific (or at least a rational) proposition, and science deals in probabilities. Perhaps an analogy would suffice. Let’s pretend that, for whatever reason, we lived in a world where fossils simply did not survive. For whatever reason, the evidence of ancient and prehistoric animals simply did not exist, or at least extraordinarily more rarely than they currently do. What if someone were to propose that at some point in the past large reptiles roamed the planet for millions of years? In such a case, someone like PZ Myers would come along and say that the proposition simply failed to make its case, that no evidence exists, and the particular drawings of potential large reptiles were nonsensical. Would it be logically justifiable to then declare that no evidence could surface to prove the proposition? Would this analog to PZ Myers in this hypothetical world be justified in claiming that the proposed prehistoric reptiles, with their hypothetical body-structures and subsequent descriptions and drawings are failures and therefore ANY large prehistoric reptiles of these types did not exist? Further, that no evidence could exist for them? The fact that evidence is not available does not mean 1) that the thing cannot exist or that 2) some evidence might surface in the future to support such propositions. The argument that specific religious concepts of gods have failed, theologians have not presented sufficient evidence, and therefore any evidence for all possible concepts of gods could never be convincing is simply an egregious logical fallacy. I’m an atheist because evidence for any concept of gods is lacking. From this, I am willing to declare that belief in any gods is not justified. This, as Jerry Coyne says, is a tentative conclusion, just as the theory of natural selection and gravity are tentative. Do I think that evidence will surface which will convince me of a god existing? No. Do I think it logically possible that it could happen? Yes. But until it does, I’ll remain a committed atheist. I’ll continue to consider new evidence as it come along. But as PZ Myers has noted, all the evidence so far goes the other way. Therefore atheists are justified to lack their belief, and theists are not justified in their belief. But we wait for potential evidence, remaining skeptical and appropriately atheistic in the mean time.